If you use sea salt daily, internally or externally or internally, it could be beneficial for the health. There are a lot of ways to incorporate salt in the things you use every day, for example your homemade soap. If you are one to make homemade soaps and already know the process, read this article to learn how you can make you soap better by adding sea salt. The soap bar you regularly use can become exfoliating gentle scrub that is helpful for softening the skin. Below are few of the things you should be aware of when you prepare this recipe for luxurious sea salt soap. 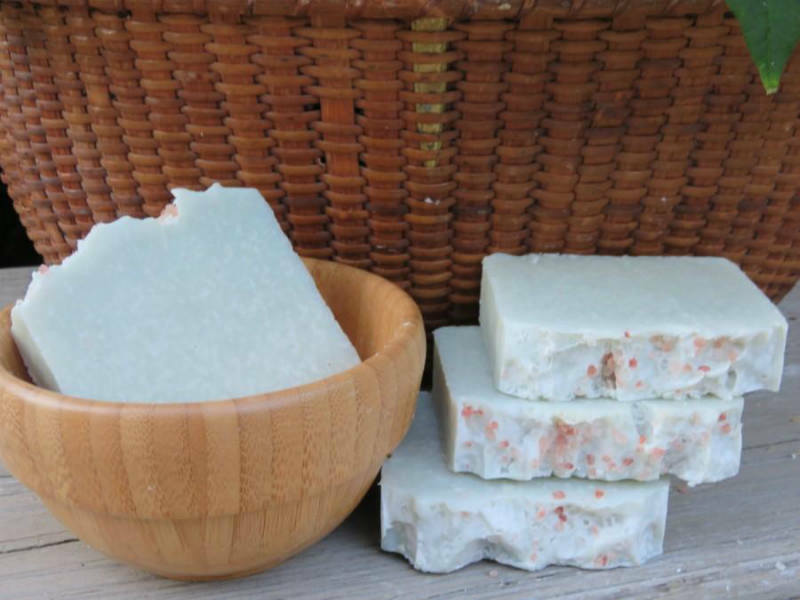 For this sea salt soap you can use your own recipe for homemade soap. Before you add the sea salt, have in mind to adapt the recipe. When you add salt to the ingredients there is a reduction of the effects of lathering. Because of that the amount of the oil (coconut oil or other) has to be increased. You should use coconut oil with 5-8% fat to give the soap a great lathering effect and form many more bubbles. If you use 70% coconut oil the percentage of the fat should be doubled. What Kind Of Salt Is Best? It should be mentioned what kind of salt is not the best choice. It is not recommended to use Epsom and Dead sea salt. Both types of salt have a lot of minerals. They contain magnesium whose presence is usually a positive thing. However, in this recipe they may cause drawing of the moisture out, leaving the soap sweaty and weepy. Regular sea salt and Pink Himalayan salt are the best choices for you. The grains should be observed when the ideal salt for the soap is chosen. The choice should be made at you leisure and your preferences. Bigger grains may be too harsh on the skin. We recommend you to use medium ones if you want not to irritate but exfoliate the skin. It depends on what you want to use it for. If you want to make a hand soap add 50%-70% sea salt. In order to make a soap that is perfect showering of the body sea salt in higher amounts should be added. You should add the salt after the water has settled and the soap has reached trace. Pour the salt in and mix with a wooden spoon. Mix fast if you don’t want the soap to harden before it is put into the molds. The most appropriate molds for this homemade sea salt soap are probably the silicone ones, because after the soap is done it is easy to pop it out! Prepare your molds. Silicone ones don’t need any preparation. If wooden molds are used they should be lined with wax paper so that the soap doesn’t stick. Weight the water and the lye using your protective equipment. Measure both with the specified quantities. Slowly put the lye into the water and mix. The mixture will become hot so be careful and wear your protective gear. Let the mixture sit until the temperature reaches 100 degrees. While you are waiting for the lye mixture to cool warm all of your oil except the essential ones in a slow cooker or any container you have. After melting go for a 100 degrees temperature. Measure with the thermometer to know for sure. When both the temperature match pout the lye/water into the oils and use the immersion blender to bring the ingredients to a light trace. It should look similar to cake batter. If you use essential oils now is the best time to blend them in. Add your salt and mix with a spoon until incorporated. Spoon the soap into your molds. Put the bars in a dry area with good air circulation and let them sit for about 4-6 weeks. I just started learning about how to make soap. Can’t wait to try and review this recipe making sea salt soap. Sounds so exotic!